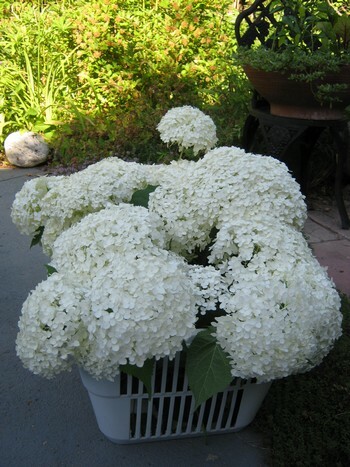 Every year I cut a basketful of hydrangea for the neighbour lady who dries them to use on her xmas tree. And every year I think: what a lovely idea, and then don’t do it myself… being stuck as I am on the ancient Elmo and Fozzie Bear I gave single Peter a hundred years ago and which he still loves, and the battered white dove that used to be the top of my own tiny singlehood tree—and how could we not hang the hideous Starship Enterprise that no one knows where it came from but if encouraged will tell you to live long and prosper. Ugliest thing you’ve ever seen but it is a nice message.